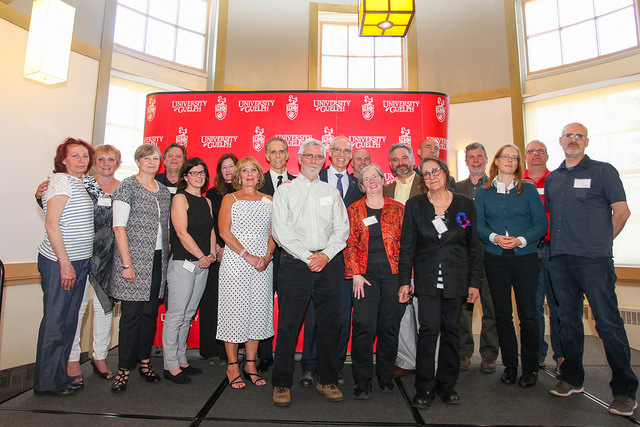 The University of Guelph celebrates its faculty and staff through formal recognition programs such as the Long Term Service Awards and the President's Awards for Exemplary Staff Service. The Annual President’s Awards for Exemplary Staff Service celebrates employees who have demonstrated outstanding service to the University community and/or who have made extraordinary contributions to the University community beyond what is normally expected in their job. More information about the awards and the nomination process can be found at the following linkhttps://www.uoguelph.ca/president/awards. This award is for exemplary activity in fostering a culture of health and safety in the workplace at the University of Guelph. This award is to recognize and honour teams who work cohesively, demonstrate a shared commitment to providing exceptional service to the University and use their combined expertise to produce high quality results. This award is to recognize and honour employees who support others and provide excellent service, behind the scenes. This award is to recognize and honour employees who are innovative thinkers and creative implementers and who motivate and inspire the people around them through their vision. This award is to recognize and honour employees who are on the front line and who, by their actions, motivate and inspire the people around them to excel in client service. This award is to recognize and honour employees who demonstrate University Spirit by fostering a sense of belonging in the University community, or by supporting and promoting the University of Guelph. This award is to recognize and honour employees who demonstrate the University of Guelph’s commitment to community service through volunteer work, both on and/or off campus.